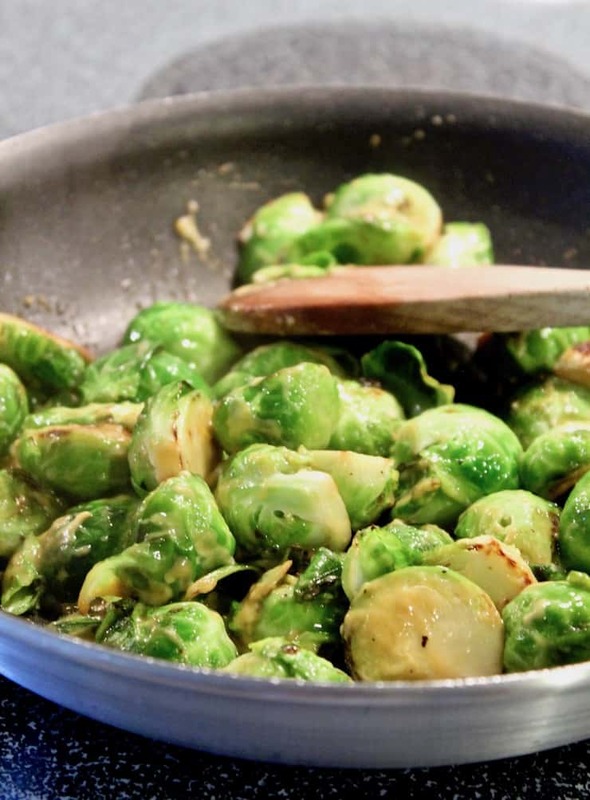 The best Brussels sprouts, caramelized with honey and Dijon mustard, in one pan, on the stovetop. Super easy and guaranteed to turn a Brussels sprouts hater into a fan. I had brussels sprouts for the very first time in my 30’s. My parents never made them when I was growing up. Then I got married. Oh boy. Lots of things my husband liked I had never had before. Early in our married life he said he had a hankering for brussels sprouts. Yes, he said hankering, or maybe our friend Jim said that. Can’t remember. So the good wife that I was (and sometimes still am) bought some fresh brussels sprouts to make for my husband. Yuck. Have no idea how I made them, probably boiled or steamed the heck out of them and then put some butter on them. Hated them and the smell. Fast forward several years and I tried again. This time I hit the jackpot. Fresh brussels sprouts, sautéed in olive oil and butter until caramelized and crisp-tender. Then, the secret — honey and dijon mustard. And sometimes, I cook and caramelize the sprouts in bacon drippings, because ~ yum ~ and because I almost always save my bacon grease (drippings sounds better) and keep in the fridge. 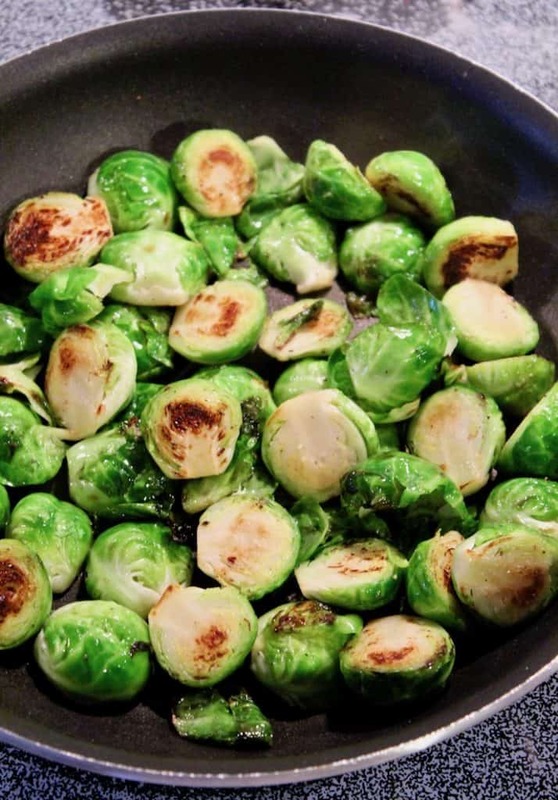 This is the way we all (yes, the kids too) love brussels sprouts. Well, my Picky Eater probably doesn’t love them but she does eat a few. I have tried other ways lately, like roasting them in the oven with balsamic vinegar and what not. I like this way better. Just really good. Not too long ago my husband texted from work asking me how I make my brussels sprouts. I asked why and he said he was telling a couple of women he worked with about them and they wanted the “recipe”… weird. When I make this I just eyeball everything, which is to say that the following “recipe” is open to interpretation. I plop in some mustard and drizzle some honey. Sometimes I just use olive oil, no butter. I did my best to pay attention to measurements on how I make this. You should start here and then adjust to your tastes. I also recommend using a good quality dijon mustard, like Maille. It has a really good flavor and bite to it. I recently started making cabbage the same way. I had some leftover and I sliced it thin and tossed it in the skillet with some butter. Delicious. Two other vegetable side dishes my family loves, and you might, too, are Glazed Carrots and Spinach Rockefeller, both perfect for the holiday table. 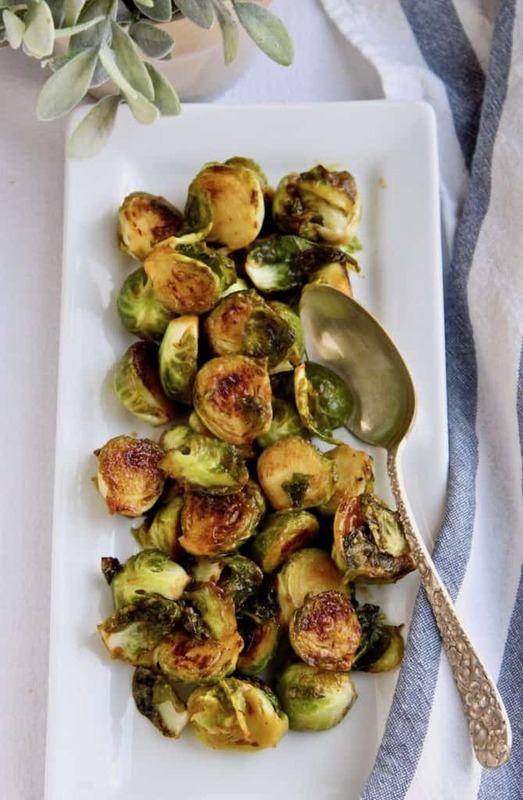 If you’ve tried these Brussels Sprouts or any other recipe on the blog, then don’t forget to rate the recipe and let me know how yours turned out in the comments below ~ I love hearing from you! You can also FOLLOW ME on FACEBOOK, TWITTER, INSTAGRAM and PINTEREST to see more of what I’m cooking in my kitchen and recipes. Brussels sprouts caramelized with Dijon and honey, in one pan, on the stovetop. Super easy and guaranteed to turn a Brussels sprouts hater into a fan. 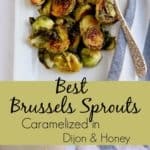 so many people do not like brussel sprouts, but this tastes wonderful! I’ve got the hankering now! I have been the recipient of these brussel sprouts and they did not disappoint. Best damned brussel sprouts this side of the Mississippi! I just made these and loved them. I will definitely make them again. I don’t like butter so I just used olive oil. So glad you liked them. I play around all the time ~ butter, olive oil, both, just olive oil. I like the result either way. I just made these today as a side for our new years meal. I love Brussels sprouts and usually roast them, but these were even better. This is a lovely recipe, will definitely make again. Thank you! I made these tonight and it is the best way I have cooked brussel sprouts. The honey took the bitterness away. Delicious! And for those dieting very few calories……………. Soooo good! Excellent job for me from my guest! I made these for my family for Sunday supper last weekend. They were a big hit. I’m making them again today for my daughter-in-law’s birthday. I was always scared of brussels sprouts as a kid, but with the right recipe – these little bundles of leaves can be delicious! People shy away from them but they can really be tasty if done right. Thank you for sharing this recipe! I love that you used Dijon. I have a great recipe that uses bacon as well. My first time! Came out delish! A real winner….thanks! Easy and delicious. Definitely making this recipe again! 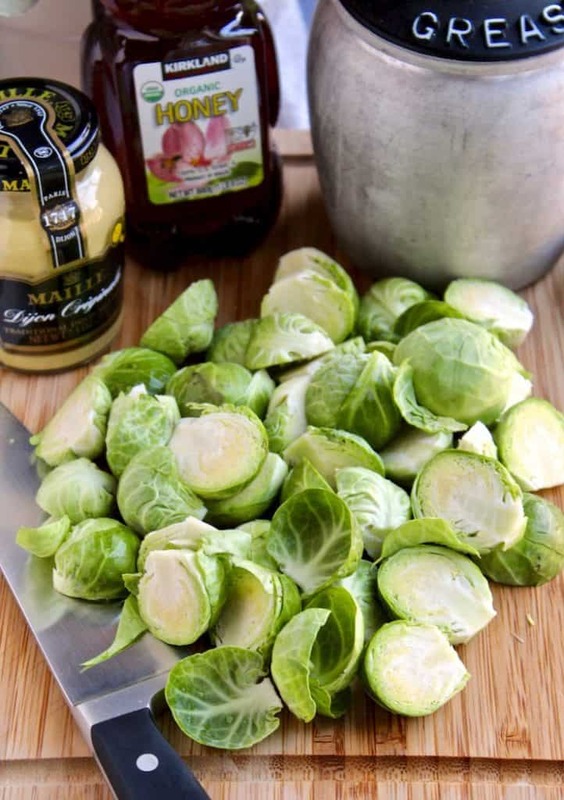 This is my family’s favorite way with Brussels sprouts, everyone likes them and they are so easy. Glad you liked them. Made them for the 1st time. They were easy to make and very delicious . They are so good and easy, glad you tried them and hopefully you’ll make them again! 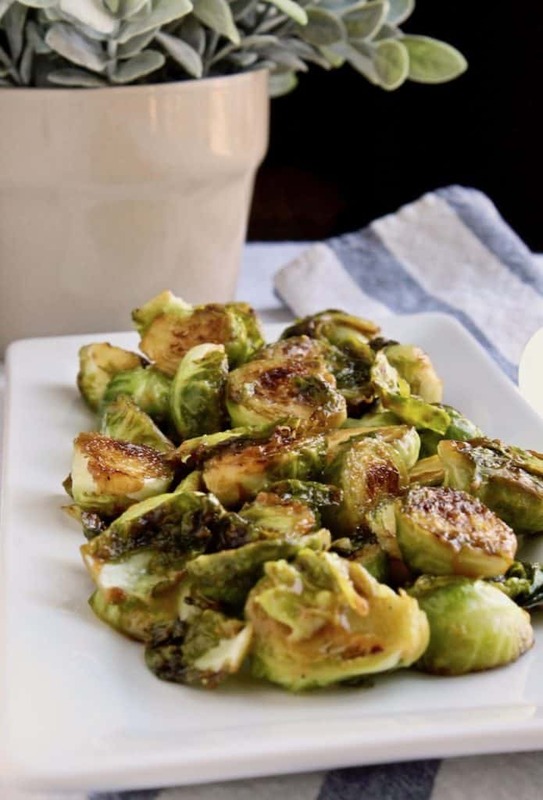 This is my new favorite brussels sprouts recipe! If I have bacon on hand, I like to cook a few slices, remove them from the pan, cook the brussels sprouts in the bacon fat (omitting the other oils and butters), and then throw the crumbled bacon back in at the end. With or without the bacon, these sprouts are delicious! I don’t remember seeing any approximate time it takes “in the fry pan to cook and stir till brown.” I have no idea how long it takes to cook and stir….using med. high heat or low heat? Hurry please, I want to make these in two days for a dinner. Thank you in advance. Medium heat, stirring occasionally until browned, and crisp tender when pierced with a knife, usually about 8 to 10 minutes. It’s really your preference how tender you want your sprouts, I like them very brown but not mushy. After adding the mustard and honey, I only cook another couple of minutes. Hope that helps! Made these tonight and they were super! I love love love Brussels Sprouts anyway and make them all sorts of ways (although I had kind of settled on roasting them as my go-to). But this. This just might be my new all-the-time favorite. Thanks so much for sharing it!! a child. Later on my husband would roast them-he did all of the cooking (which I loved). My husband passed away 4 years ago and I just recently started cooking for myself. I tried this recipe and it was glorious!! It was also faster than roasting and I’m a sucker for anything carmelized! Thanks for sharing with me! I’m so glad you liked these Brussels sprouts. My dad did all the cooking too, and my mom has been cooking for herself for awhile now. She loves these Brussels!